Eylon (Fluorometholon & Tetrazoline Hcl) is a combination preparation. It is used in acute allergic non infectious conjunctivitis,keratitis & non-infectious inflammation of eye like anterior uveitis episcleritis and scleritis. 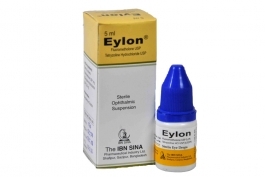 Eylon is available as 5 ml sterile eye drops.